Carlos Menchaca, Costa Constantinides, Vanessa Gibson, Ritchie Torres, and Antonio Reynoso: Five StreetsPAC-endorsed City Council candidates who'll be bringing a fresh perspective to districts outside Manhattan. Barring an unlikely run-off victory by former comptroller Bill Thompson, de Blasio will move on to face Republican Joe Lhota, a disappointment so far on livable streets issues, as well as former Bronx Borough President Adolfo Carrion, the Independence Party candidate, and tech entrepreneur Jack Hidary, running on the Jobs and Education line. Most of the City Council primary winners, meanwhile, are all but guaranteed election in November. 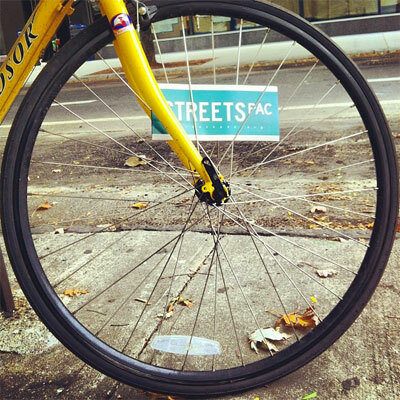 These are the races in which StreetsPAC’s endorsements and volunteers made the biggest impact. In 13 of the 18 council primaries where StreetsPAC made an endorsement, the candidate won. The most significant victories came in District 38 (Sunset Park, Gowanus, and Red Hook), where challenger Carlos Menchaca knocked off incumbent Sara Gonzalez, and District 34 (South Williamsburg and parts of Bushwick and Ridgewood), where Antonio Reynoso put an end to former Brooklyn Democratic boss Vito Lopez’s bid to resuscitate his political career. Other StreetsPAC candidates winning contested open seats include Ritchie Torres in District 15, replacing the term-limited Joel Rivera; Vanessa Gibson in District 16, replacing the term-limited Helen Foster; Mark Levine in District 7, replacing the term-limited Robert Jackson; and Costa Constantinides in District 22, replacing the term-limited Peter Vallone Jr. These elections could have an immediate impact on livable streets projects. Levine’s district, for instance, includes the western blocks of 125th Street, and as a candidate he asked NYC DOT to revive plans for Select Bus Service on the congested corridor. These elections could also affect the all-important race for City Council speaker, decided by council members themselves, which has huge implications for legislation and public hearings. Menchaca’s victory, in particular, was seen as a blow to Council Member Inez Dickens’ bid for the speakership. Dickens gained a third term yesterday by defeating Vince Morgan in one of the races where the StreetsPAC endorsee came up short. Few of those races provided quite as stark a difference between the candidates: Dickens has stonewalled pedestrian safety improvements on Adam Clayton Powell Jr. Boulevard and done nothing to advance 125th Street Select Bus Service, both projects that Morgan supports. In three central and eastern Brooklyn districts — the 35th, 36th, and 42nd — StreetsPAC-endorsed candidates placed second in races with several candidates. (Though in District 36, where Kirsten John Foy trails Robert Cornegy by less than 100 votes, the race has yet to be called officially.) And on the Upper West Side, StreetsPAC-endorsed Mel Wymore was bested by Helen Rosenthal, who ran with some good transportation ideas but unlike Wymore didn’t make them a centerpiece of her campaign. Rosenthal is on the record supporting protected bike lanes for Columbus and Amsterdam Avenues and dedicated bus lanes for the neighborhood. In borough-wide and citywide action, the finalists in the public advocate race, Dan Squadron and Tish James, both have livable streets bona fides from their tenures in the State Senate and City Council, respectively. Scott Stringer, a consistent voice for safer streets and one of the only NYC pols to tackle the issue of sky-high subway construction costs, topped Eliot Spitzer in the comptroller race. Ken Thompson ousted six-term incumbent Charles Hynes in the Brooklyn DA’s race (Streetsblog will be taking a closer look at the implications for traffic justice). Melinda Katz won the Queens borough president race amidst an undistinguished field. And Gale Brewer, the lone candidate who unabashedly professed support for bike-share, will succeed Stringer as Manhattan borough president. All told, as the city prepares for the end of the administration that did more than any other to reform the cars-first status quo on NYC streets, these are some very encouraging results. They suggest that changes like bus lanes, bike lanes, and pedestrian plazas won’t just be the legacy of the billionaire mayor, but part of a lasting, far-reaching transition to more humane streets. The grassroots political muscle and awareness that StreetsPAC injected into this election cycle helped make that happen. Re “the end of the administration that did more than any other to reform the cars-first status quo on NYC streets, these are some very encouraging results”: or, a subtle reminder that a lot of phenomena are simply born of their time and environment. Just like Giuliani wasn’t really needed to see crime drop, Bloomberg probably wasn’t needed to reverse the status quo on streets, and someone else may even have done it better. People are sick of being stuck in traffic, not being able to afford cars anyway, and having crappy transit. They want something better. I still haven’t seen much to alleviate worries I’ve had about de Blasio for months, namely that he is wishywashy and will probably not be afraid to compromise core values. Still, I’m glad he [probably] won. I tend to agree. We’re seeing movements to take back the streets from motor vehicles nationwide. Maybe thanks to JSK some things happened a bit earlier here than they would have otherwise, but I think the writing is on the wall. Cars just aren’t the ticket to freedom the automakers promise. Finally a significant number of people are realizing that, especially in urban areas. I’m thrilled that liveable streets is finally becoming a politically viable issue. If we ever achieve even half the clout motor vehicle lobbies have, we’ll accomplish great things. And yes, with all due respect to JSK, there are some things which could have been done better with regard to bike infrastructure. In her defense, she was severely constrained both by budgets, and later on inability to remove parking. Hopefully her successors will face fewer such constraints. In a perfect world, maybe. But in the real world where the alternative was Mayor Bill Thompson I doubt you would have seen such changes as Times Square, 8th/9th Aves, 1st/2nd Aves, bike share and many smaller projects. Would a first-term Bill Thompson, dependent on tabloid endorsements and donations from the motoring class have stuck with a “controversial” DOT commissioner, much less appointed her in the first place? Highly doubtful. Some of this stuff would have happened eventually, but it happened much sooner because Bloomberg and JSK were willing to take a lot of risks in the face of some very vocal opposition. To me it’s the difference between NYC being seen as a leader versus it following what other American cities started to realize for themselves. I disagree. The stuff NYC pioneered (protected bike lanes, NACTO Bike Guide, ped plazas), while not new in concept, were instrumental in pushing other US cities to do more sooner. NYC has such a prominent place in the national and international spotlight that whatever is done in NYC reverberates much much more than efforts in most other cities in the world. I also think that the advent of StreetsPAC is a major major step for the liveable streets movement. Going to meetings is great, but having someone full time in city hall and the state legislature who will fight for liveable streets is much much more effective. Kudos to the team that put this together and congratulations on a very successful first election! I agree with you about Thompson, but why start with him? Bloomberg previously defeated two candidates who might have been significantly more progressive on these issues. NYC isn’t particularly a leader on street issues either. Many cities around the world are ahead of us by decades, having had bike lanes in the 20th century. Hell, NYC is continues trying to get buses to do trains’ job, which still puts our planning squarely in the 1960s on transit. I just tend to think it’s appalling how far we haven’t come, given that we started out ahead of everybody else with a massive pedestrian culture and high transit use. I highly doubt Fernando Ferrer or Mark Green — both highly dependent on unions, donors, tabloid endorsements etc. — would have taken these risks. Remember that it’s exactly these kind of old-school NYC “progressives” who currently have an active lawsuit against the PPW bike lane. I’m with you on cities around the world. In comparison to most of western Europe, NYC is a third world country. But when it comes to American cities, we’re seen as a leader. And Bloomberg deserves a ton of credit for his leadership and supporting JSK’s. No argument there. Just look at where we are, or rather aren’t, as far as new subways go. The outer boroughs grew by leaps and bounds but there has been no major subway expansion since the 1950s. And I share your feelings about the planned use of BRT instead of subways. Maybe you’re right, maybe you’re wrong about Ferrer/Green. I tend to think Green is a bit more like de Blasio, and Ferrer is a bit more like Thompson. But then, de Blasio could still turn out to be one of those PPW types too, or at least could capitulate to them. Regardless, anyone else would have been up against the same demographic wall as Bloomberg, with a swelling population of ex-suburbanites who can’t afford cars, need transit, and have lots of student loan debt. That, in fact, is the situation around the USA, and NYC just experienced it first. I’m not even denying that Bloomberg really might have initiated something, but in the end it’s still probably less the person that matters than the times. I agree about reverberation, but not so much about leadership. It’s not a bad thing that NYC borrowed ideas that numerous northern European cities implemented decades ago, but I find it a bit striking how NYC is still tepid about, NIH about, or outright resisting other good ones. Certainly NYC is on the forefront of American demographic shifts, however, which supports my main point: it was less Bloomberg, and more the times. Every election post on streetsblog so far has lauded Costa Constantinides and I can’t figure out why exactly. While he doesn’t appear to be hostile to the livable streets movement, I haven’t seen him say he has any concrete ideas about what to do with transportation issues. He crammed a million flyers in my mail boxduring the campaign and I don’t think they ever mentioned anything other than unions on them. I know we just had primaries but how come there is no love here for Green party candidate Lynne Serpe? can’t believe cumbo won the 35th. what a disappointment. Fair point. There is certainly a ton that we can do better– the city too often favors baby steps (SBS, sharrows, and buffered bike lanes) instead of real game changers (BRT, bike boulevards, and cycle tracks). Bloomberg, himself rarely took the lead on anything transport-related. Congestion pricing was bungled from the start due to his lack of leadership and he was never much of a cycling advocate and never stood up to Ray Kelly. That said, he did appoint JSK and did a lot to support her. I’m not sure we’d have seen the FHWA endorse a NACTO Urban Bikeway Guide without strong leadership from NYC. I am not contending that Bloomberg’s administration was perfect when it comes to safer/complete streets policies. However, I find it very hard to believe that any of other alternatives would have appointed and steadfastly supported a transportation commissioner like JSK and would have ignored the tabloid idiocy on the subjects of pedestrian plazas, bike lanes, and Citi Bike. Viewed from the perspective of a complete/safe street advocate, Bloomberg should be considered a success. I don’t disagree with people’s criticisms of Green and Ferrer so much, but you have to balance their disadvantages with their advantages over Bloomberg. They certainly gave more of a sweet damn about the needs of the lower and even middle classes than Bloomberg ever did. This even shows even in Bloomberg’s street/transit improvements, which mainly went to wealthier neighborhoods that needed the investments less. So, if they had been elected and then swept up in the same trend, there is no ruling out it could well have been much for the better. You mean this Freddy Ferrer? My problem with Bloomberg is his sticking with Ray Kelly running the NYPD, because Kelly carries out what the other compartment in Bloomberg’s brain wants. JSK presented the Engineering side of the equation, but Mayor Mike can’t see that the Enforcement and Education – the other two legs of the stool – have been missing. DOT moves us 3 steps forward, the Cops pull us 2 steps back. Stopping the 2003 Anti-War March, stopping the RNC marchers and cyclists, stopping Critical Mass rides and encouraging expansion of Stop and Frisk have all come from the other corner of Bloomberg’s brain, far away from the DOT traffic safety corner. It will be interesting to see how our new mayor balances these differences. Yeah, I am bummed about this, too. REBNY’s massive amounts of direct mail probably made the difference. And she got to disavow it, too. And she didn’t even show up for the one debate. This is the replacement for Tish James. Bleah. Because running on the green party line has not proven an effective way to be elected to the City Council in NYC. Even for an open Council election. If you’re not willing to recognize that, I’m not sure you can be an effective politician. Not doubt that’s horrendous, but is it more evil than appointing Seth Pinsky to an economic development corporation? Depressingly, the real estate industry’s favorite candidates were in many cases the same as StreetsPAC’s and the godawful-on-transit-issues Working Families Party (“We endorsed Mathieu Eugene–please take us seriously!”). Just evidence of how many directions this process pulls politicians, I suppose. Council races. That’s because, in my opinion and experience, livable streets advocates and real estate interests are not natural enemies and can work together productively. And if it’s not uncouth for a PAC to brag about it’s win-loss record…. StreetsPAC-endorsed candidates had essentially the same win-loss record as Jobs for NY candidates–even though StreetsPAC endorsed challengers to incumbents and Jobs for NY didn’t–while StreetsPAC spent approximately 1% of what Jobs for NY spent! I’m ludicrously biased here, but I think an endorsement from StreetsPAC will always be more powerful than one from a bunch of landlords. StreetsPAC is what it says it is and though someone may not agree with what it advocates, at least it’s clear what it’s after. Jobs for New York is just cynicism incarnate: using that bludgeon word “jobs” to advance a vague business agenda that I think the overwhelming majority of New Yorkers rightly assume will not actually serve their interests. And I hadn’t realized that Jobs for NY hadn’t opposed any incumbents. That’s a very telling fact about the current city council.